2 AMMO of Mig Metallic acrylic paints: Old Brass and Brass – effectively a base coat and highlight pair. From a product point of view, I have never used AMMO, Secret Weapon or Broken Toad products before, so these are of interest to try things out. It’s a nice touch that products have been grouped together, rather than just supplying some random assortment of colours. Whilst the box contents are interesting in themselves, what lifts this offering way above the ordinary is the painting guide that is included. This gives an introduction to each product, plus several ideas on how best to use them. It’s this guide which, in my opinion, really adds value to what Asset Drop have to offer. The issue I have is with the whole ‘subscription box’ model in general. 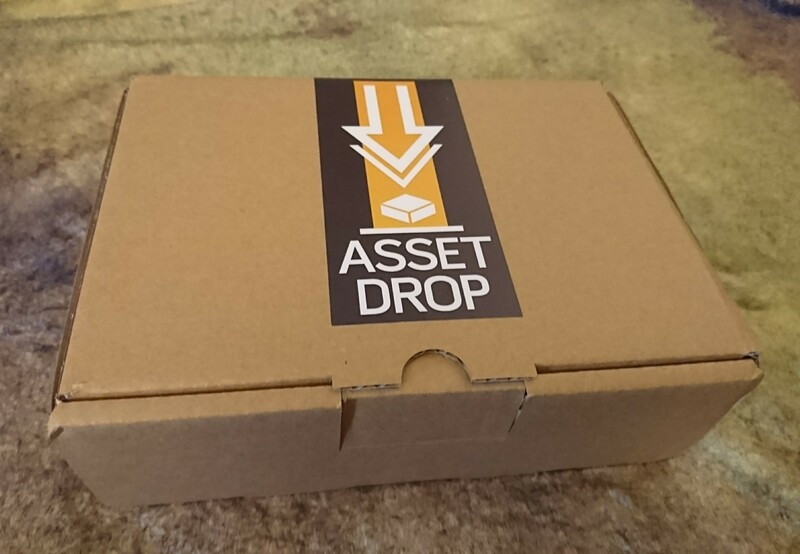 Asset Drop offer two services – monthly and three monthly (they recently dropped the six monthly subscription) – this gives around 25-30% discount on the products included in the box – good value on the face of it. However, this is a completely blind purchase. You have no idea what is coming in each box – there isn’t even a clue given with any sort of theme – so you are completely at the mercy of Asset Drop that you will find the contents of the box of use. Now, given that the contents are paints, this is less of a risk than buying a model subscription box, for example – the vast majority of gamers will usually find a use for most paints. I will admit that part of the USP of Asset Drop is that they aim to provide products that you might not usually order, thus giving you the option of trying something new. I just don’t think I’m in the target product demographic. Customers who potentially have small collections of the product on offer, so that the majority of the box contents are of use. Customers who actually enjoy the whole surprise aspect of blind purchasing. For myself, especially since my own paint collection is somewhat extensive (and some would say, contains many classics of the genre, but let’s not go there!) Asset Drop is not something I would consider. I would much rather spend the money on paint products that I need at the time. I accept that this means I am more likely to stay with what I have found to be ‘tried and tested’ brands, and so may miss out on discovering something new, but also my current hobby budget does not extend to spending around £20 essentially ‘taking a punt’ on something interesting turning up at the end of the month. In conclusion, Asset Drop have put together a perfectly good product: well composed, well supported (with the painting guide) and very well presented – it’s just not for me. You can find out more details about Asset Drop by visiting their website. Orders for the December box need to be placed by December 7th 2017.